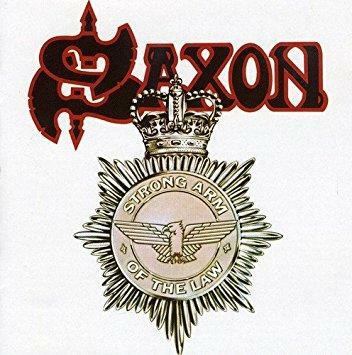 Released in October 1980, Saxon's third album (and second LP of 1980!) was the second to be produced by the band in association with Pete Hinton at Ramport Studios. Opening with the self-explanatory 'Heavy Metal Thunder', like its predecessor Wheels Of Steel, Strong Arm Of The Law features many tracks that have remained staples of Saxon's live set to the present day, including ’20,000 Feet’, ‘Hungry Years’ and ‘Dallas 1pm’, a song about John F Kennedy’s assassination, revealing the band’s social conscience. Strong Arm Of The Law now includes the complete 1982 Kid Jensen B15 session, recorded live in the studio for BBC Radio 1, new mixes taken from the original 24 track tapes of ‘To Hell And Back Again’, ’20,000 Feet’ and ‘Heavy Metal Thunder’, remixed at Abbey Road Studios by Pete Mew. It also features two previously unreleased songs in ‘Mandy’ (an early working version of ‘Sixth Form Girls’, plus the jokey, off-the-cuff ‘Mule Train’. It also features rare memorabilia and extensive liner notes by Classic Rock and Metal Hammer writer Jerry Ewing, written in co-operation with lead singer Biff Byford.